Our company is highly esteemed in the manufacture and export of Bumper For Railway. These bumpers have great quality and outstanding design. 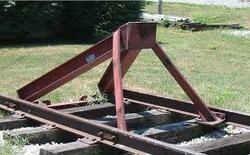 These are developed and designed for use in the railways. These are dimensionally accurate and undergo quality testing under the supervision of our highly skilled industry professionals. Guards are definitely a must for Suv’s and it can be fitted in to smaller cars also this protects car bumps & tail lights during any kind of collision. Products for Rear Bumper Guards: Classique, Ajanta, Century the best brands are available.